This blog is dedicated to the four cornerstones of my life - avodat Hashem, my family, sports and something that goes with all three - BEER! In full disclosure, R' Mansour did not say this vort this week, it actually was his shiur on Parshas Tazria - HaChodesh which I listened to two Fridays ago while driving to work and then again on Sunday. The shiur had some wonderful insights on the Hagaddah and I very much wanted to blog it this week in advance of the Seder. Same rules as usual apply, although I have not attempted to summarize the entire shiur, I have tried to reproduce these vorts to the best of my ability. Any perceived inconsistency is the result of my efforts to transcribe the shiur and should not be attributed to R' Mansour. R' Mansour noted that at the seder there are two washings, but one is called Urchatz and the other Rachtza. He wondered why the two washings are given different names. He gave some credence to the rhyming factor (in the Kadesh Urchatz song) and explicitly said that he was not belittling this. But he wanted to say a deeper explanation which he also tied into the Charoses. R' Mansour observed that the only Vav in the names of the Seder is Urchatz. Why not just called it Rachatz? He quoted R' Shlomo Zalman Auerbach who writes that Rachtza is a reminder, but Urchatz is a command. He explained that all year long we wash our hands for bread, so there was no reason to direct us to wash. But since we don't wash for vegetable dipping all year long, there needs to be a specific direction to wash the Urchatz. R' Mansour also quoted R' Yosef Chaim Sonnenfeld, who explains that according to the Magen Avraham the second washing (Rachtza) may not be necessary as if a person kept his hands ritually clean after Urchatz there would not need to be a washing before the Matza. R' Mansour next quoted the Gemara in Pesachim 115b in which R' Chisda made a derash - if one washed his hands for the first dipping, he should still wash his hands for the second dipping. But this is not the time that we wash again! Tosafos explains that the second washing is for the Matza, but why not explicitly say so in the Gemara? R' Mansour next quoted another Gemara in Pesachim which says that the mitzva of Charoses is to remember the Tapuach. R' Mansour remarked that the gemara then gives a recipe for making it which includes Tapuach. Rashi ties this to the Pasuk in Shir HaShirim "Tachas HaTapuach Orrarticha" which refers to a miracle which took place in Egypt. There, the Jewish women conceived and gave birth. The Gemara in Sotah explains that the Jews were enslaved in Egypt for centuries. The men gave up and thought they would be there forever. However, the ladies had tremendous bitachon that the Jews would leave one day and they said - there is no point to leaving if there is no nation to leave Egypt. They went and convinced their husbands to procreate out in the Tapuach fields and to give birth there - six at a time (based on Shemos 1:7 and its six languages of growth). The ladies then said to Hashem - we did what you asked, now its up to You. The Gemara explains that the ground then opened up and swallowed the babies - VaTimalei Ha'Aretz Osum. Hashem sent down angels with nutrition and they fed the children and they grew and eventually came out of the ground and came home. This is why we eat the Charoses - to remember the valiant acts of these women under the Tapuach. R' Mansour also noted that the women were rewarded for these acts when the Mishkan was dedicated as it states in Shemos 38:8 that the Kiyor was made as a copper basin. albeit without specifications for its size. The Kiyor came from the mirrors of the Tzovos. The meforshim explain that there was a legion of women who wanted to donate for the Mishkan and that they indicated that they wanted to donate their mirrors. This was initially rejected by Moshe who thought the mirrors were an artifice of vanity. Rashi explains that the women used the mirrors to make sure they were presentable and Moshe was disgusted by this. Hashem said to Moshe - accept them, because the mirrors belong in the Mishkan and they are more dear to Me than all the other donations. Hashem explained that through these mirrors, many Tzivos were born in Egypt. R' Mansour noted that it states many times that Hashem said that he took his Tzivos out of Egypt. R' Mansour quoted R' Samson Refael Hirsch who notes that it states B'Maros and not M'Maros. If it was M'Maros it would mean that they melted down what was donated and then raw material was made into the device. But B'Maros means that the actual mirror was beaten and transformed - and this was why there were no specifics for the dimensions. R' Mansour then returned to the Rashi and explained that the mirrors were used by the women who look beautiful and entice their husbands and they would both look in the mirrors together and this would draw them together. Because of the mirrors they came close and then the babies were born under the Tapuach. But why were the mirrors specifically used for the Kiyor? R' Mansour noted that the Kiyor was also used in the Sotah process. The woman is placed in front of the Kiyor as if to say - your grandmother looked in a mirror to entice their husbands and you used the mirror to entice another man. R' Mansour also quoted the Chida who notes that the Jews left Egypt early (after only 210 years instead of 400) because they did extra work and hastened the geulah. The word Kiyor is also turned around as RiKu - Hashem (26) appeared after 210 years because of these mirrors. R' Mansour then asked - why were the children called Tzovos? He looked for the first time that Tzava is mentioned in the Chumash - in the Vayechulu (Bereishis 2:1) where it states "V'chul Tzva'am." R' Mansour quoted R' Samson Refael Hirsch who states that not every gathering of multitudes means war, only if the group follows the command of one - then it is a Tzava. Thus here, the Tzvaos are the children who all loyally followed Hashem and when they got to Har Sinai they said Na'aseh V'nishma. These children got their character of following the direction from their mothers who said - there is a command for Pru U'rvu, notwithstanding the marror we are suffering. R' Mansour next quoted the Ba'al HaTurim who notes that there is another Maros as well - Bereishis 45:2 - where Hashem came to Ya'akov in a vision - B'Maros HaLilah. In this vision, Hashem says to Ya'akov, don't be afraid to go down to Egypt. Ya'akov was concerned about the tumah of Egypt and its potential impact on his family. And Hashem says - don't worry, they will be a great nation there. But what was the vision? Ya'akov saw Moshe building the Mishkan and the women were bringing their mirrors and Hashem commanded Moshe to take the mirrors. Ya'akov saw that the mirrors were responsible for propagating the Jewish people as the women used them to entice their husbands and that as a result there would be loyal Jewish nation which would leave in great numbers. When Ya'akov saw this he said - we can't rely on the men, but the women will cause the creation of a great Jewish nation. (R' Mansour also said that the gematria of Tzivos and Tapuach are the same, but asked others to check him). R' Mansour next quoted a sefer called Shemesh HaMagen which is a commentary on R' Shimson Mastropoli's letter. I have not fully written all that he said about the sefer, but he mentioned that there is a great power on the 14th of Nissan to fight the Yetzer Hara and that this comes from Mordechai's actions in warning to Esther (4:14) don't be quiet B'Es HaZos -at this specific time. Why? Because the Jews will be making a bitul and getting rid of their Chametz and it is time of great response from Hashem when fighting Amalek. R' Mansour also quoted R' Hutner who explained that the Milchama B'Amalek M'Dor Dor (Shemos 17:16) - means that Amalek tries to get in the way of transmission of the mesorah M'Dor Dor - he does not want more Jewish children following our tradition. R' Mansour said that when we burn the Chametz we get rid of Amalek's philosophy and we come to the seder where the kids ask the question and then answer them as well as the father sits there listening to the Torah of their children (and loving it -Ed.). When do we start dealing with the children? At Karpas, when there is already a change from the regular meal. Right before Karpas everyone goes to the sink - and we say - if it wasn't for the Jewish women, there would not be a Jewish nation. We call this Urchatz. And later according to the Gemara we go back to the sink before we dip the Marror in Charosetz. There was bitterness in Egypt, but the Tapuach sweetened it. Thus both washings are due to the great contributions of the Jewish women. Ya'akov saw those Maros Tzovos and he was satisfied that because of the Jewish women there would be a nation to leave Egypt. R' Mansour closed the vort by stating that Dor Dor appears twice in the Hagaddah - B'Chul Dor V'Dor they stand against us as a hint to Amalek, but we also say B'Chul Dor V'Dor we must feel like we are leaving Egypt and seeing that we are part of the Tzvos. If you have seen this post being carried on another site, please feel free to click www.kosherbeers.blogspot.com to find other articles on the kosherbeers blogsite. Hey its free and you can push my counter numbers up! 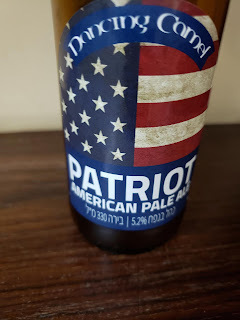 This week's Sunday Night Suds looks at Dancing Camel's Patriot American Pale Ale. The Dancing Camel brewery was among the first wave of craft breweries in Israel, but for some reason I had never sampled any of its products until my recent trip to Israel in January. Knowing their reputation for producing quality beer, I saved this for one of my last Israeli beers to try. The beer poured a darker gold than I expected, but there was decent carbonation and the hops exploded when I brought the beer to my face, even before I had my first sip. There was plenty of fruit with grapefruit up front, but this was not a one trick camel. Successive sips had coppery hops and pine which reminded me of some of the better Redhook IPAs (while they were still kosher). 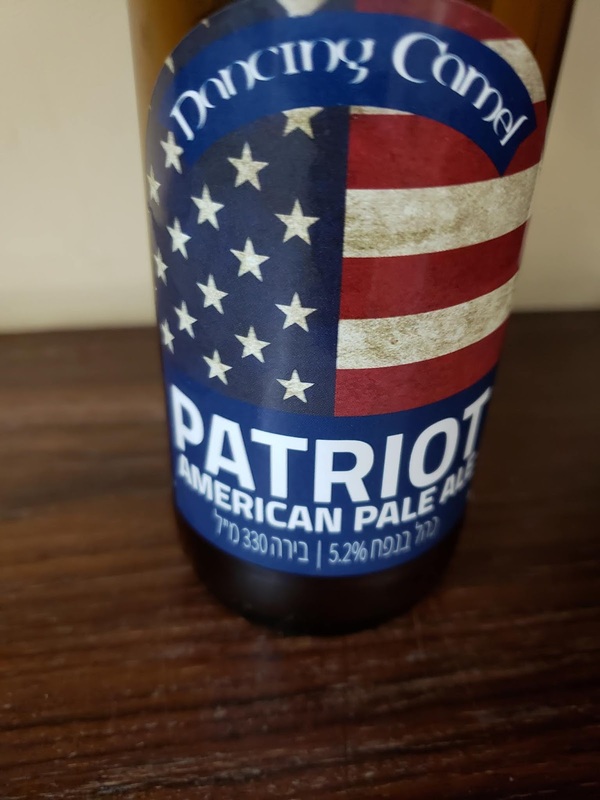 Dancing Camel's Patriot American Pale Ale is certified kosher by the Rabbanut of Tel Aviv and there is a kosher certification mark on the label. To see what the experts on Beer Advocate think about the brew, please follow this link https://www.beeradvocate.com/beer/profile/15578/46106/. As always, please remember to drink responsibly and to never waste good beer unless there is no designated driver. If you've tried this beer or any others which have been reviewed on the kosher beers site, please feel free to post your comments (anonymous comments are acceptable). Lastly, if you have seen this post being carried on another site, please feel free to click www.kosherbeers.blogspot.com to find other articles on the kosherbeers blogsite. Hey its free and you can push my counter numbers up! This week R' Frand did not give his shiur on the parsha as he customarily cedes the pulpit to another Rav for the last shiur before Pesach. Rather than leaving this page without a vort on the Parsha, I will be reproducing a vort from R' Frand from a prior year. Same rules as usual apply - I have attempted to reproduce this vort to the best of my ability. Any perceived inconsistencies are the result of my efforts to transcribe the shiur and should not be attributed to R' Frand. In Parshas Metzorah, the Torah goes into detail about various forms of tzara'as (loosely translated as leporosy) and how they are treated. The Torah writes about three categories of tzara'as - those occurring on houses, clothing and on the body. Chazal write that the affliction is not a physical illness. Instead, it is a sign of a spiritual problem which manifests itself as a physical ailment. Rabbi Frand stated that the "disease" actually develops in stages - first on the home, then on the clothes and finally on the body. In Vayikra 14:33-57, the Torah discusses the malady of tzara'as of the house. In so doing, the Torah states at 14:35 that the homeowner comes to the Kohain and tells him "K'nega Neera Li BaBayis" - like an affliction has appeared to me in the house. Rashi (quoting a mishna in Negaim 12:5) writes that the person tells the Kohain that it appears to be a nega even if the homeowner is an expert in determining whether a spot is tzara'as. Tosafos Yom Tov asks on the mishna in Negaim - if he is a talmid chacham, why does he not simply state - this is a nega? Tosafos Yom Tov gives four answers. The first answer (said in the name of R' Eliyahu Mizrachi) is that a person should teach his tongue to say "I don't know" - that a person should not always believe that he knows it all. The second answer was that a person should show derech eretz to the Kohain. The third answer given is that the homeowner should not attempt to influence the Kohain's decision. The final answer given by the Tosafos Yom Tov is that the homeowner should not be "poteach peh l'satan" - not give the satan an opening to allow bad things to happen. Rabbi Frand then asked two more questions. The first (in the name of the Tosafos Yom Tov) question was - why is this taught only in negai batim? The second question (which was asked in the name of the Tolner Rav) was why is this rule not equally applicable to other halachic questions? When a person asks his rav a shaila about kashrus or taharas hamishpacha, he is not prevented from giving his own opinion as part of the conversation! The Tolner Rav answers the questions by explaining that the nega on the house is an indication that there is something wrong with the way that the children in the house are being raised. The Tolner Rav then teaches each of the Tosafos Yom Tov's four answers as applicable to this scenario. The first cause of the nega could be because the parents give the impression that they know everything. Children should be taught that there is nothing wrong with saying "I don't know" and that their parents do not know everything. The second possible cause of the nega could be because the parent does not show respect towards others who are lower in stature or intelligence. This is also not a proper atmosphere to raise children. The third possible cause of the nega could be that the parents are too dominating in their personalities and they do not allow the children to grow and assert themselves. The fourth possible cause of the nega could be that the parents are always looking at the negative possibility - assuming the worst and making the children feel that there is no hope -thus allowing their very fears to come true. This is the reason that the lesson only appears by negai batim - because a person needs to know that he must carefully examine the education of the children in the home. 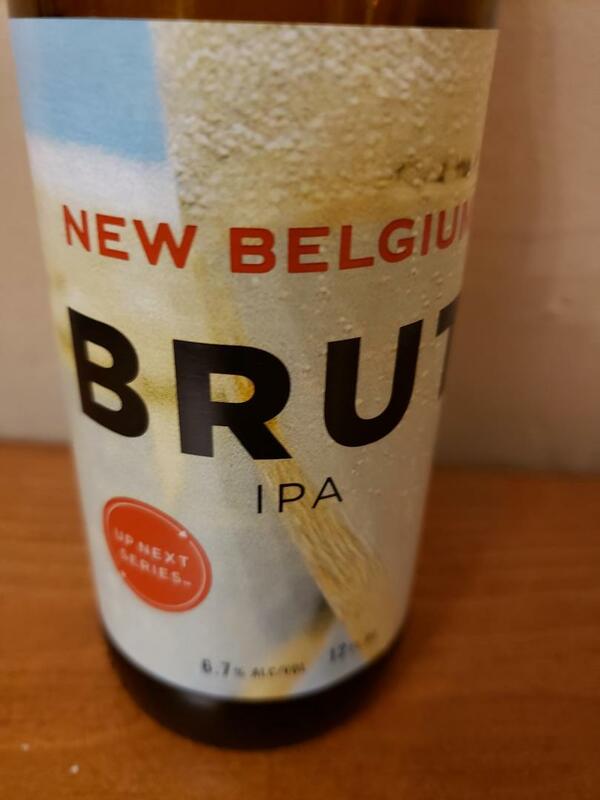 This week's Sunday Night Suds looks at New Belgium's Brut IPA. I picked this up in Oliver's Brew Crew in Albany, New York. I can always count on them having limited release beers which we cannot get down here and the Up Front limited edition series from New Belgium is a prime example. The beer was released around New Year's and was supposed to evoke thoughts of champagne. It did not do that for me, but it was a tasty variation on a traditional IPA. The beer is brewed with five different types of hops (many of which I have never heard of) - Huell Melon, Nelson Savin, Azzaca, Citra and Amarillo. One of the newest styles to excite brewers and drinkers alike, Brut IPA first appeared in California in late 2017 and is notable for its effervescence and extreme dryness. Pale straw to pale gold, this style is intended to be lighter in color and body than a typical American IPA. For that reason, the mash is often some combination of Pilsner malt, wheat, corn, and/or rice. The addition of an amylase enzyme reduces the final gravity even further. Bitterness is also kept to a minimum. Fruit-forward flavors and aromas are achieved by late hopping, dry hopping, and the use of neutral ale yeast strains. In short, these beers are highly attenuated, late hopped IPAs inspired by the appearance and mouthfeel of Champagne. The New Belgium Brut IPA is 6.7% abv, but there is little in this beer that would give the impression that its on the higher end of the alcohol scale. It is rather light and went well with the cholent, although our friend Rabbi F who originally hails from Manchester preferred a stout for his cholent. The New Belgium Mighty Brut IPA is under kosher supervision by the Scroll-K/Va'ad of Denver, and their symbol is on the bottom of the six pack holder. However, not every brew produced by New Belgium is under kosher supervision, so look for the Scroll K on the six pack holder or box when considering purchasing any NBB product. To see what the experts on Beer Advocate think about New Belgium Brut IPA, click here https://www.beeradvocate.com/beer/profile/192/364095/. The following is a brief summary of some of thoughts said over by R' Frand on the parsha this evening. I have attempted to reproduce these vorts to the best of my ability. Any perceived inconsistency is the result of my efforts to transcribe the shiur and should not be attributed to R' Frand. R' Frand began by quoting the famous gemara in Erchin in which R' Shmuel Bar Nachmeni states that tzara'as comes for one of seven reasons, including speaking lashon hara, killing, adultery, stealing, being stingy or being haughty. The Ba'al Haturim notes that the Torah states in Vayikra 13:45 that the person who has leprosy "Rosho yehiyeh paruah" - the hair of his head should be unshorn [translation courtesy of Art Scroll]. The Ba'al Haturim states that there are four times in Tanach that the word Rosho appears - twice in connection with the Metzorah, once in Noach in connection with the Migdal Bavel (Bereishis 11;4) where the head of the tower was to be in the heavens and once in Job in which it states that his head was in the clouds [feel free to post the cite in Job in the comments if you know it]. The Ba'al Haturim explains that the tzara'as comes because a person thinks too highly of himself and his head is in the clouds. R' Frand next noted that when the Metzorah brings his sacrifice, in addition to the pair of birds, he also brings cedar wood and ezov (moss). The moss is amongst the lowest of the plant life and the cedar the tallest. Rashi explains that this is symbolic that the person was afflicted with tzara'as because he was haughty and he needs to lower himself like the distance from the tall cedar to the lowly moss. The Sfas Emes asks - why is that the person needs both the moss and the cedar? If the point is to humble him, why not just use the moss alone? The answer is that the person needs to do more than just feel humble, he needs to recognize what he has been given and the source for the gift. R' Frand explained that the afflicted person was haughty for a reason - he actually had certain gifts that he felt prideful about. The cedar is the symbol of that greatness, but he needs to realize that the gift is from Hashem. This is the purpose of the moss, to drive home that he is not the reason that he has these things and that he is nothing without Hashem giving them to him. R' Frand said that he once heard a story from R' Meir Zlotowitz who said that the Chofetz Chaim was heard late in life saying - what can I do for You Hashem to repay You for all the good? One would think that the Chofetz Chaim could feel that he deserved what he had because of all the seforim he wrote, but he felt like he owed a debt to Hashem to repay Him for the gifts. R' Frand closed the vort by going back to the Sfas Emes who noted that Moshe was the greatest Anav because he was also the wisest person and recognized that everything came from Hashem. This week's Sunday Night Suds looks at HaDubim brewery's Phoenix IPA. 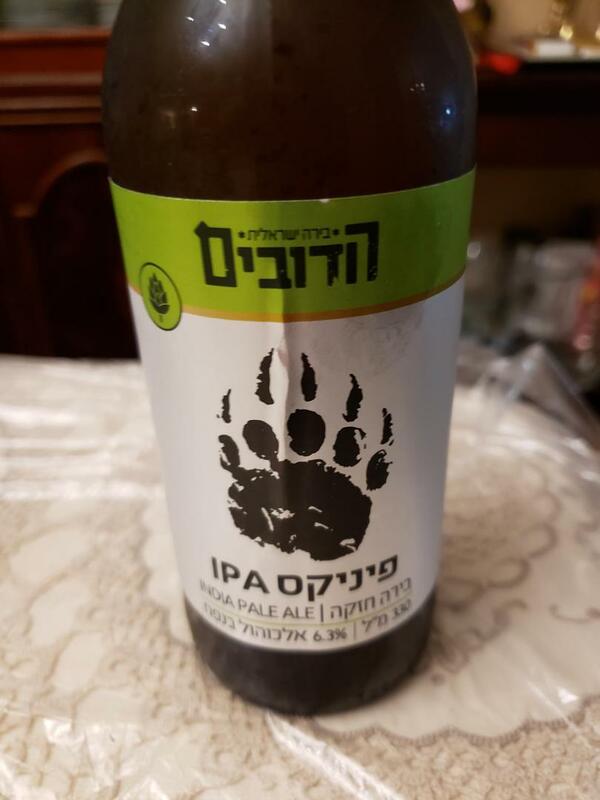 (No, I could not tell that the name of the beer was Phoenix, it was only when I looked the beer up on BA that I saw that they had reviewed the HaDubim Phoenix IPA and realized that this spelled Phoenix in Hebrew). This is another of the IPAs that I picked up on our recent trip to Israel. The beer is made with three kinds of hops - Simcoe, Chinook and Magnum, the last of which is not a hop variety that I am familiar with from American brews. They call this beer a "strong beer", ostensibly because it is 6.3% abv, which is not super high for an IPA, but maybe is by Israeli standards. The beer poured a rich dark copper and had great lacing and perfect carbonation. I enjoyed it with Mrs KB's garlicy olive chicken (with perfect crispy skin!) and the flavor combination was phenomenal. There was something about the spicy hops and pine notes which melded very well with the garlic, olive and pepper notes in the chicken and if I had more of this I would repeat with other garlicy dishes (like takeout chinese). The Hadubim Phoenix IPA is certified kosher by the Rabbanut of Kiryat Gat and there is a kosher certification mark on the label. To see what the experts on Beer Advocate think about the brew, please follow this link https://www.beeradvocate.com/beer/profile/34339/286867. When I first started this blog back in 2008, I perceived a lack of readily available information as to the kashrus of beer available on the market. As such, I began publishing a list of beer which I knew to be kosher based on my own e-mailing with various kashrus organizations. Boruch Hashem, the work performed by the CRC has obviated the need for me to create my own list. In addition to the list of beer known to be under hashgacha, the CRC list also contains sections which identify beer which is approved and that which is not recommended, based on research they have done on breweries which are not under supervision. Additionally, the CRC list is updated on a constant basis, as opposed to my list which I only updated around Purim and Labor Day. As such, I would recommend that anyone looking for information on a specific beer first check out the CRC list CRC Kosher Liquor List. If there is no information on the CRC list about the beer which is the subject of your inquiry, feel free to email me at kosherlawny@gmail.com. I am a 48 year old lawyer, happily married with four kids. When not fighting with insurance companies trying to get them to honor their policies (aka Work) I enjoy Daf Yomi (20 years and counting), spending time with my family, sports and of course, beer. All content is property of the owner of this blog. No material other than the Tuesday Thoughts on the Daf and the Thursday Parsha Tidbits may be copied or otherwise distributed without the express written permission of the owner of the blog.